This Rice Krispie Ice Cream Dessert is simple, insanely delicious and is sure to become a family favorite dessert, I promise. We are huge ice cream lovers at our house. If you saw how many containers of ice cream I usually have in my freezer, you’d probably laugh or maybe even judge us :). My boys can open a brand new half-gallon container and have it gone it one night. They don’t know the meaning of a small bowl of ice cream. 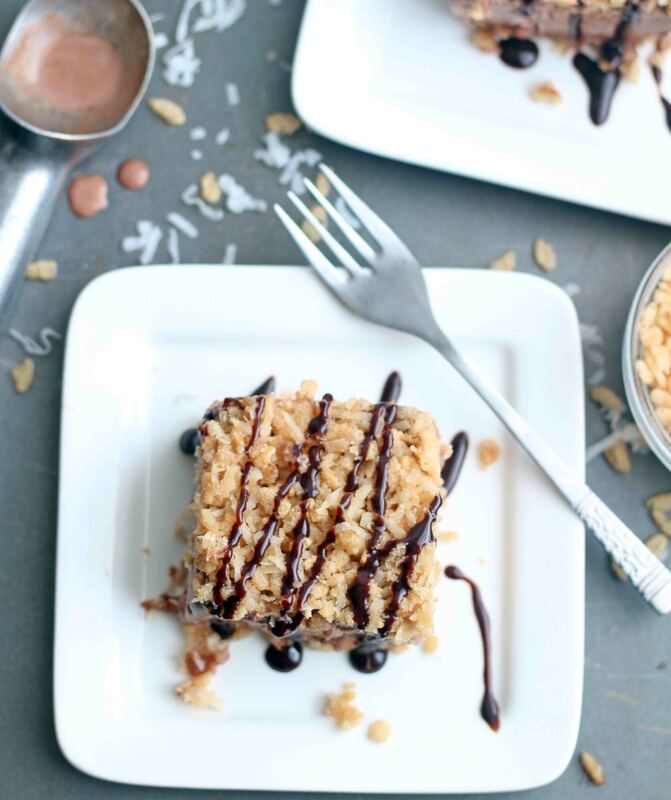 Because my boy’s love of ice cream is real, I knew this Rice Krispie Ice Cream Dessert would be a sure-fire winner at our house. This dessert was actually called Aunt Betty’s Ice Cream Dessert, but since I don’t know who Aunt Betty is, and because I changed up the recipe just a bit, I gave it a more descriptive name. I do know that if Aunt Betty were my aunt, I would love her to pieces and she’d probably be my favorite aunt because she definitely makes a killer ice cream dessert. Funny thing is, my husband does actually have an Aunt Betty, but this isn’t her recipe. So Aunt Betty, wherever or whoever you are, I love, love, love you for sharing this ridiculously delicious dessert. This dessert is so fast and simple to make. I started making it 20 minutes before we left for church a couple Sundays ago. It took me 10 minutes to make and then I threw it in the freezer and had dessert already for that day. You can use any flavor of ice cream with this and it will be delicious. I made it with Tillamook Chocolate Peanut Butter (our fav!) and it was amazing. I can’t wait to try it with other flavors. You can use any favorite flavor ice cream with this dessert. I used chocolate peanut butter and it was fabulous! In a medium saucepan, melt butter and brown sugar together over medium low heat. Remove from heat and stir in Rice Krispies and coconut. Press a little more than half of the Rice Krispie mixture into the bottom of a 9x9-inch baking dish. Carefully spread softened ice cream over crust. Spread remaining Rice Krispie mixture on top of the ice cream and gently press. Freeze several hours or until ice cream firms back up. Growing up we always had it with vanilla ice cream with a raspberry sauce. Yum!! That would be delicious! I’ll have to try that.